Area (approx): 840 sq. ft.
Playground R.V. Storage Pet Friendly Trash Incl. Beautiful manufactured home in excellent condition. Pride of ownership shows throughout! Home offers a large living room, and a beautiful eat-in kitchen with breakfast bar. Almost new, white refrigerator and washer/dryer, stainless steel dishwasher and stove. 2 bedrooms, 1 bathroom, beautiful landscaped yard. Fenced yard provides privacy and is perfect to enjoy a BBQ with family and friends. Deck is the perfect spot to enjoy your morning coffee. This home has been lovingly cared for, and it comes with a custom built storage shed. 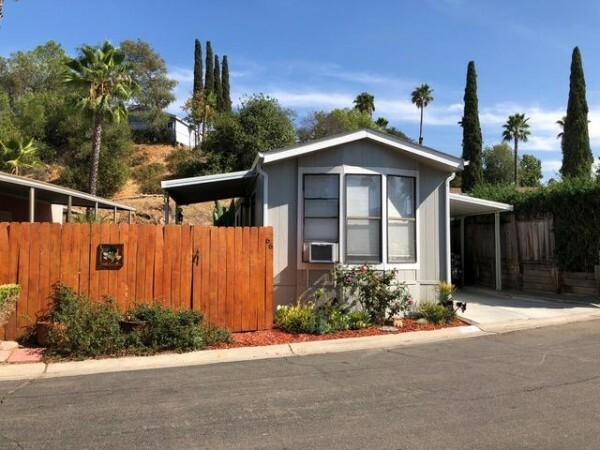 Large driveway, great location within Los Coches Mobile Home Estates, a highly desirable, pet friendly all age community. Don't miss out! Washer/dryer and refrigerator in pictures are not included.